The best five minutes of the movie, (a rare touch by the scriptwriters) is when the hero is trapped underwater in a car, with a metal band around his wrist courtesy the villans. He goes 100 feet away from the car and - KABOOM! So what does the guy do? This is the only time you are gripped by the feeling, "What will happen next?" 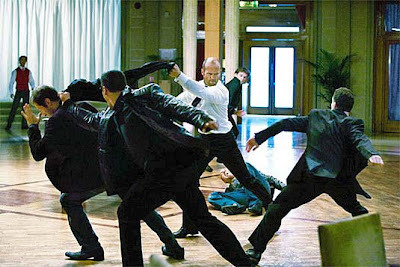 Otherwise, this Jason Statham starrer has the usual - fast cars, loud blasts, stunts, macho hero, girl with seduction written all over, Transporter 3 takes the trodden path, you have seen it before, but you are not bored yet. Some action scenes may remind you of the Hndi films of the nineties - hero breaking through a wall in one piece, hero crashing through glass, again intact.Expect the usual, let your brain sleep and enjoy!